EM technology is used in a variety of ways in goat husbandry. Users report very positive experiences in feed, in the pen and in manure treatment. In particular, bad smells and fly infestation are a thing of the past. Initial cleaning and regular bedding treatment results in colonisation by positive microorganisms, which prevent bad smells, fly infestation and decomposition. Pour the mixture into the bucket of the high-pressure cleaner and clean and wash out the pen thoroughly. Do not forget the corners and gaps as there is heavy germ colonisation in those areas. Spray diluted FHE – it is important to distribute the product evenly in the pen. Do not forget ventilation shafts, gaps in the roof etc. Spray undiluted or diluted FHE – it is important to distribute the product evenly in the pen. 2 to 3 times per week. Spray slightly more in areas used for defecation and urination. For sawdust: Spray the sawdust slightly more as it is very absorbent. Spray FHE over the slurry/liquid manure channels, add charcoal. For soil improvement, the addition of ZeoBas (basal rock dust) is recommended. Important - Only add the ZeoBas (basal rock dust) to the liquid manure immediately before use and do not scatter charcoal in the areas where the animals lie down as this can lead to black colouration. Spray FHE over the solid manure and add charcoal. For soil improvement, the addition of ZeoBas (basal rock dust) is recommended. Important - Only add the ZeoBas (basal rock dust) to the solid manure immediately before use and do not scatter charcoal in the areas where the animals lie down as this can lead to black colouration. Spraying promotes growth of dense, lush grass. It suppresses dock growth and plants contain more antioxidants and bioactive substances. 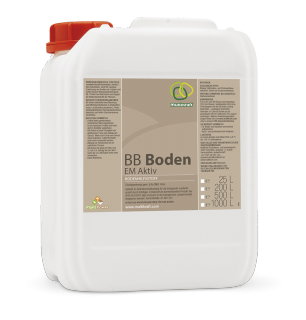 Mix BB Soil with water and spray the pastures and meadows with the BB Soil solution. Apply after every cut, preferably in the evening or early morning (not in strong sunlight). Alternatively, 50 L of BB Soil / ha can be applied at the same time as solid manure. The quality of drinking water plays an important role in animal husbandry. 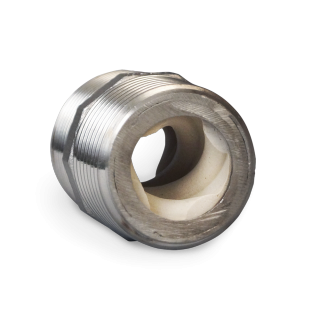 It can be improved significantly in the well or the pipes. 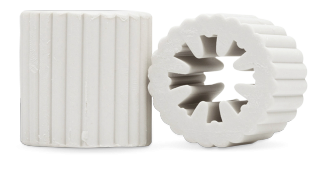 Install the EM Ceramic Water Reactor in the pipe - 5 x EM Ceramic 35 mm Pipes, 2 magnets and 2 spirals interact to produce the desired effect. For even better water quality, you can have the EM Ceramics Swirler professionally installed in the inlet pipes - Caution: Note the flow direction of the water. The EM Ceramics Water Reactor and Swirler have a limited service life. They should be dismantled and cleaned at least once a year. Always install EM Ceramic Grey Pipes along with the EM Ceramic 35 mm Pipes at a point in the domestic well where they are immersed in a good flow of water. The lower the pipes can be attached, the more effective they are. 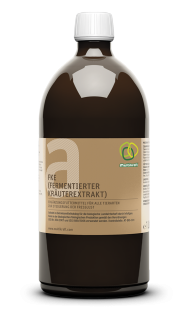 To increase appetite, FHE (Fermented Herbs Extract) is added directly to the feed. 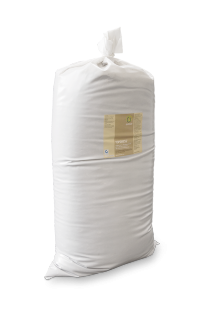 0.5 % charcoal (dry feed base) binds ammonia and nutrients in slurry, liquid manure or solid manure. Add FHE to the feed daily. A different mixture has also proved effective in practice: 79 L water, 20 kg cut beets and 1 L FHE. Allow the mixture to soak overnight and then administer 1.5 L per animal per day. Also add Topdress to the feed daily. Automatic spraying system: Time, quantity, interval and duration are determined by computer - after these settings the spraying in the barn takes place fully automatically. Hygienic advantage: a double hose system - air and FKE (fermented herbal extract) are transported in two separate lines. Fodder mixer wagon with spray nozzles: FKE (fermented herbal extract) is sprayed during the mixing process. Chain feeding injector: During feeding, FKE (fermented herbal extract) is sprayed onto the feed. Feed screw injector: The feed is mixed with FKE (fermented herbal extract) via an injector on the screw. From there it is transported by the screw via the elevator to the silo. Due to the FKE insert, the feed remains more stable in the silo and oxidation processes are minimized. Dosing with spot mixing system: FKE (fermented herbal extract) is added as a separate component to the spot mixing system. This allows the admixture rates to be changed at any time. 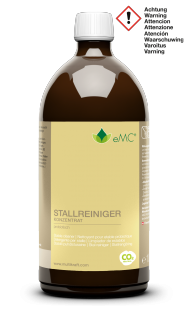 Injector technology for silo filling: FKE (fermented herbal extract) is automatically sprayed evenly onto the feed via an injector nozzle during silo filling. Thanks to the FKE insert, the feed remains more stable in the silo and oxidation processes are minimised. Pipe feeding: During feeding, FKE (fermented herbal extract) is added to the feed through the pipe.